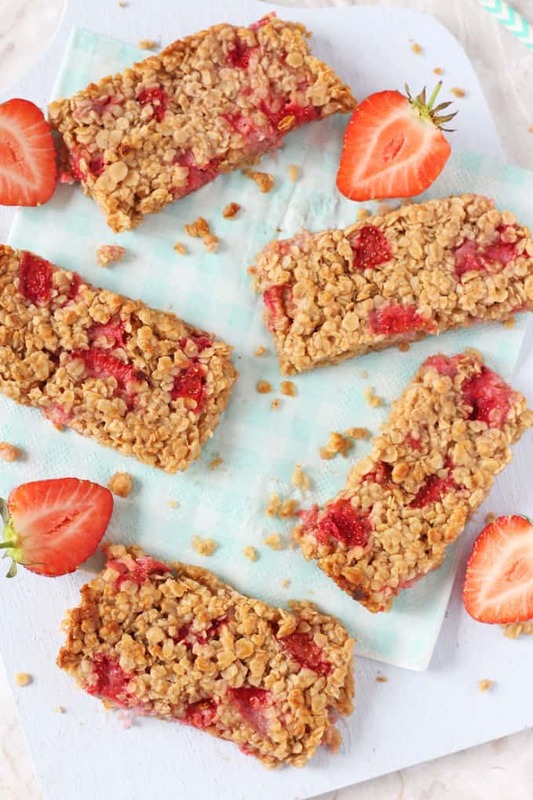 A delicious soft oat bar recipe packed full with sweet strawberries. 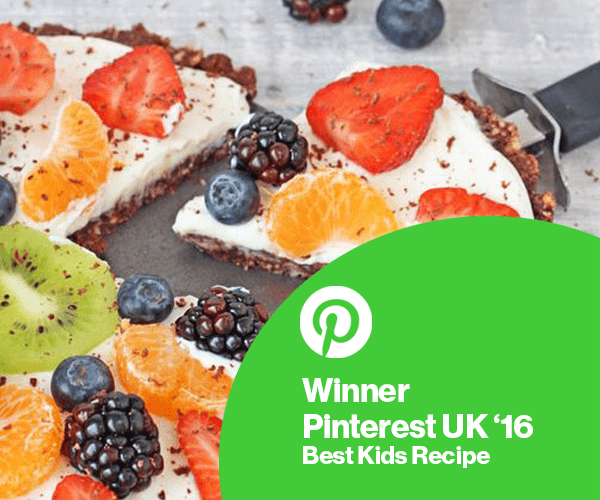 A tasty and healthy snack for toddlers and older kids! My little boy has turned into an absolute food monster recently. I can’t believe that at just 2 years old he’s already eating me out of house and home… and that’s saying something considering I always have food to hand! He seems to be particularly fond of snacks so I’ve been making an effort to try out some new homemade snack recipes on him and these Strawberry Oat Bars have been a big success! 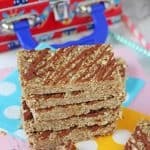 The base of these oat bars are made with my standard mixture of oats, nut butter (I used peanut butter here but almond or cashew butter works well too), coconut oil and honey. 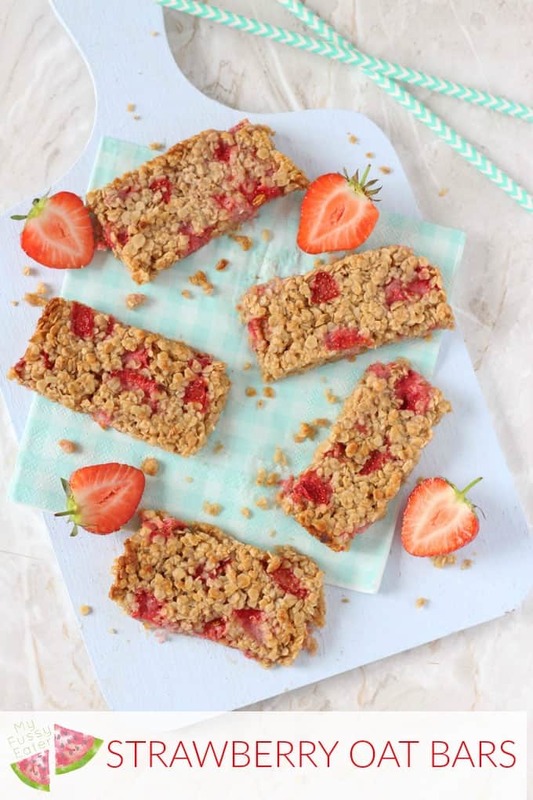 I then added some chopped fresh strawberries to give it a delicious summery flavour. 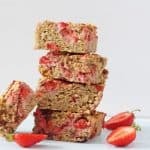 These bars are gluten, dairy and egg free and are packed full of slow releasing carbs and protein; enough to keep my little man full until dinnertime! One thing I should point out is that these bars are very soft. 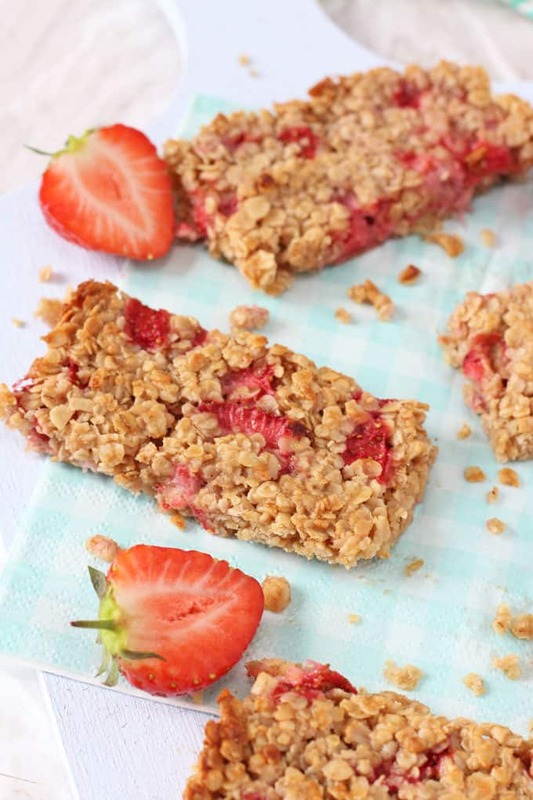 They are not crunchy or chewy like a normal granola bar so don’t be disappointed! 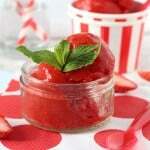 However, this does make them ideal for younger kids and toddlers as the softness makes then really easy to eat. If you try this recipe please do let me know what you think. 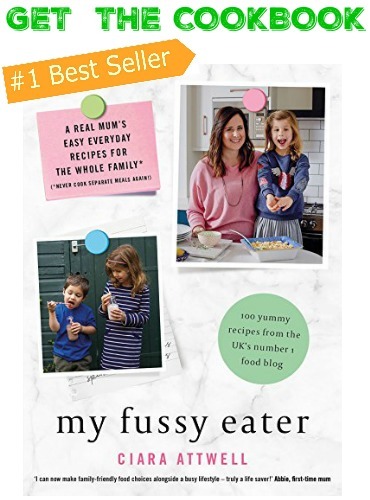 And tag me in a picture on Facebook or Instagram using the hashtag #myfussyeater. 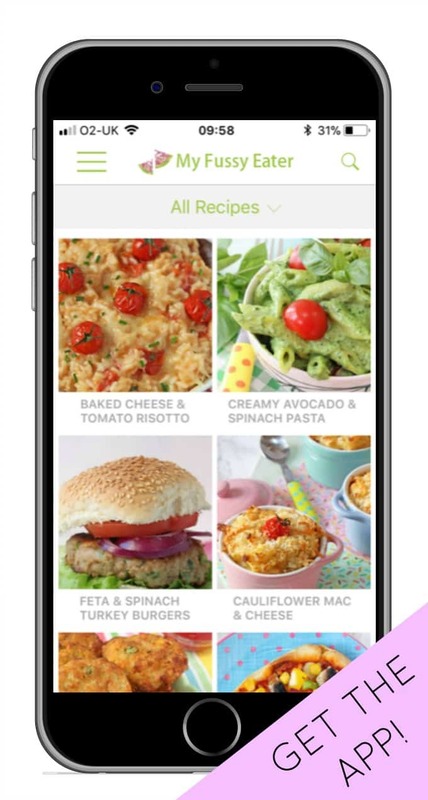 I really love seeing all your pictures of my recipes and your little ones enjoying them! Preheat the oven to 180c / 350f. Grease and line an 8x8inch dish with parchment paper. In a saucepan melt the coconut oil. Add the nut butter and honey and stir until all the ingredients have melted together. Pour this mixture into a large bowl. Add the oats and mix well. Gently fold in the strawberries and then transfer the mixture to the lined dish, pressing down the top with the back of a spoon. Leave the oat mixture to cool to room temperature in the dish, before putting it in the fridge for 30 minutes. This step is very important. If you don’t do this the mixture will fall apart when you try to cut it! Cut into 8 large or 16 small slices. Hice ayer y en verdad me encantó! 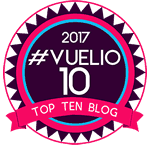 Espero pronto hacer la receta de brocoli con huevos y queso. Really nice and moist. Froze well too. Recipe is good, however falls apart easily. Had it with greek yoghurt & was delicious. Requires more butter and honey to keep it together! Tried to make these! So delicious but went soggy a little on the bottom so I put in oven again and they worked amazing! Next time going to try less Coconut Oil and chop my strawberrys smaller. But so happy with these. Delicious! I made mine with almond butter, honey and frozen raspberries, no idea if my toddler will eat them but I certainly will!! Thanks for sharing this recipe. Trying again today with smaller bits of strawberry and a little less honey. Hi Laura, I don’t use any honey in my recipe so this might have changed the consistency of the bars. Same thing happened to me – maybe specifying how big the strawberries should be would be good. I’ve also thought about using dried strawberries next time. 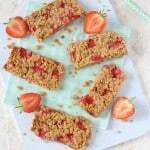 Homemade oat bars are great and these look so delicious! Yes you can. Wrap them individually in parchment paper and freeze them in freezer bags or containers! my ĺo has to a nut allergy, any idea what I could use instead? Hi Anna, you could try sun butter instead.